Today we dragged ourselves away from Boothaus Roll in Zeuthen. We have been here since 12th July. This is the longest we stayed anywhere. In our hearts we did not want to move but we must as we have a Gap Year to continue with. Even though we don’t speak German, we had really started to feel at home here and have got to know a number of people. 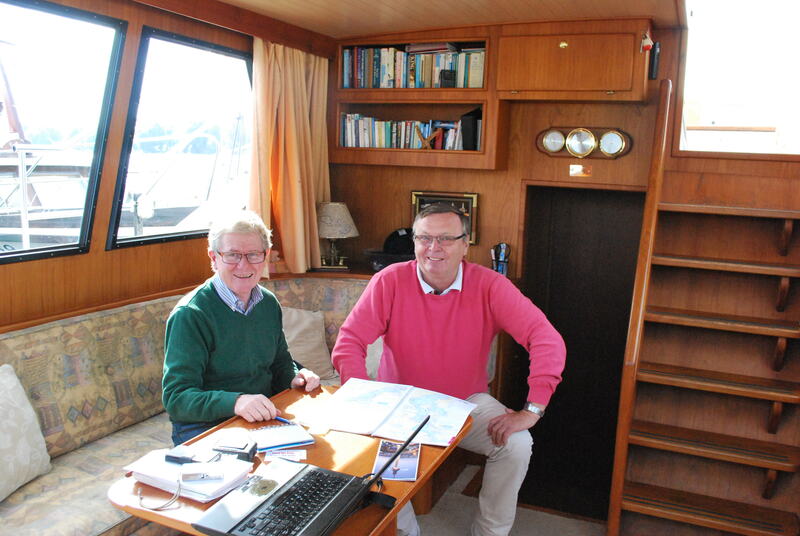 Herr Roll and Adrian – H. Roll is wearing a Skerries Sailing Club shirt ! Like many things that have happened on the Gap Year, our stay in Zeuthen happened by chance. 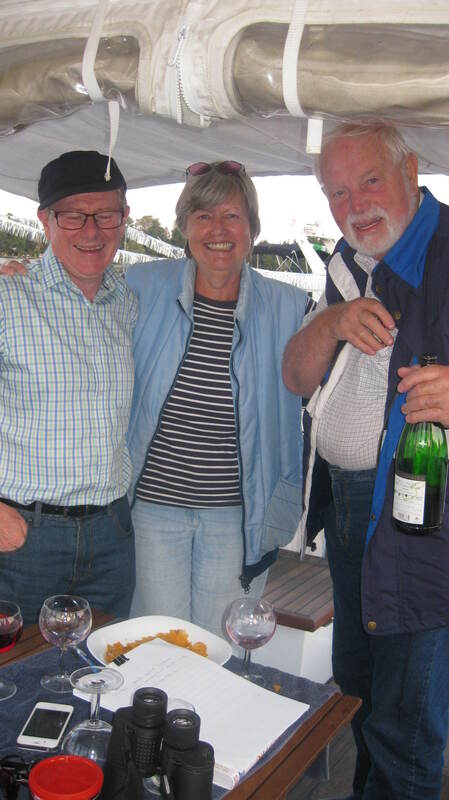 At the Arsenal Marina in Paris we meet Dr Angelia and Franz Paulus. We told them we were going to Berlin and we needed somewhere safe to leave the boat while we returned to Ireland for holidays. 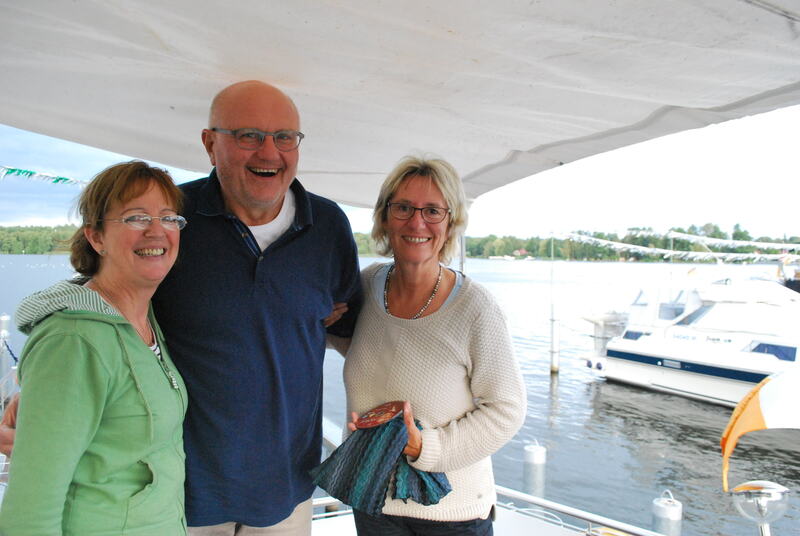 They said we should go to their home marina and that Herr Roll lived on the premises and would look after the boat when we were not around. And so he did, along with Ulrich who owns a boat in the marina. 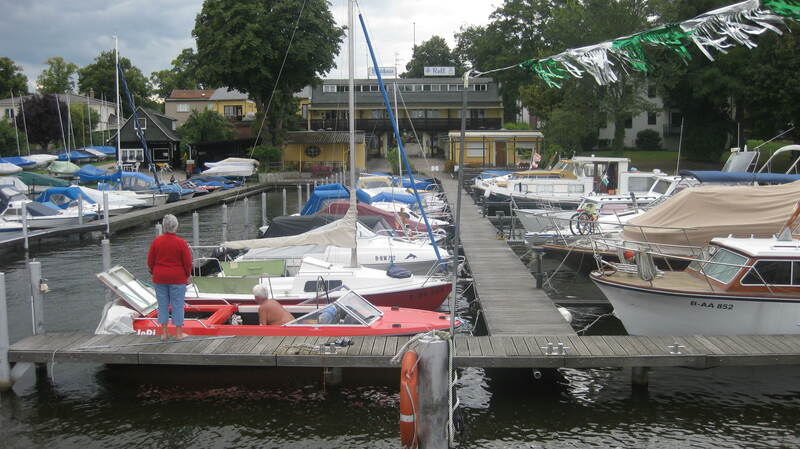 It turned out to be the perfect place to stay in Berlin as the lake is very beautiful. Zeuthen was in the former East Germany and you can still see evidence of how the area is still developing, even though it is only 30 miles from the centre of Berlin. While there are some new buildings, most of the roads are still old cobble stones and there are little or no footpaths. From here we will go to get diesel and stock up with food at Netto Supermarkets ( you can moor the boat right beside supermarket). Then we are going to spend two days going back through Berlin. We plan to meet Nuala’s friend Heike again and visit the Berlin TV tower. After that we will motor to Potsdam and stay one day in the centre of the city (this is based on Ulrich’s advice as he says it very beautiful). 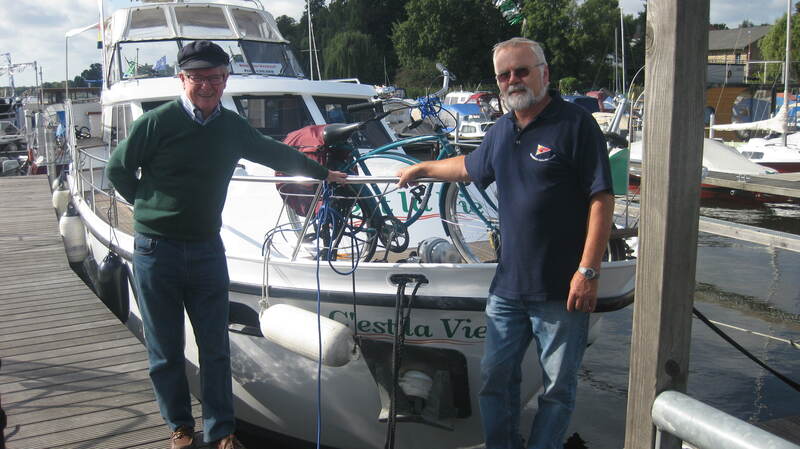 We will then head back along the Elbe Havel Canal, Mittelland Canal and the Rhine to Koblenz, where it meets the Moselle river and go back into France (a journey of 825 km which will take 21 days), that’s unless the boat is sold earlier as we now have two people interested in buying it. 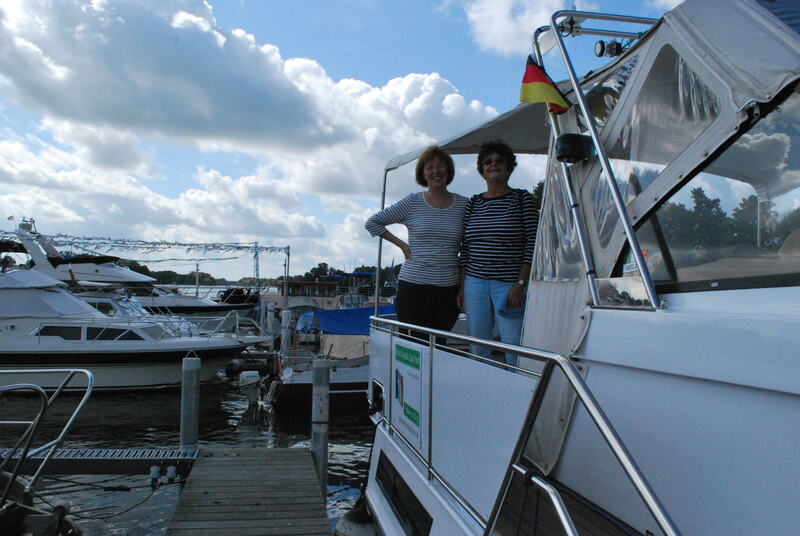 This entry was posted in Berlin, C'est La Vie - The Boat, On the Journey, People We have Meet on the Gap Year, People who have helped us on our way, Places visited and tagged Arsenal marina Paris, Berlin, Berlin TV tower, Dr Angelia and Franz Paulus, Havel Canal, Herr Roll, Koblenz, Mittelland Canal, Moselle River, Netto Supermarkets, Potsdam, Rhine, Skerries Sailing Club, Zeuthen. Bookmark the permalink. 2 Responses to Today we leave Zeuthen in former East Germany after 39 days. Hey you two! It was nice to meet you here at Bootshaus Roll!! We wish you a good and safe trip back!! Hope to see you again some time!